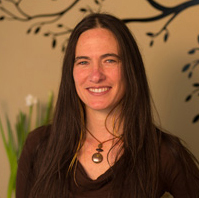 Julie Bu rke has served the Asheville community as a well-respected healer for the past ten years. In 2008, she graduated from Daoist Traditions College and opened her practice, Deep Alchemy Acupuncture. In 2012, she became a Reiki Master and is now certified to teach others. Ms. Burke enjoys sharing her clinical and life experiences as she guides and encourages students in their development. What made you want to study Chinese medicine? When I was 15, I experienced a healing crisis in the form of acute Pancreatitis. This was one of the most painful physical experiences of my life. Western medicine saved my life, but it could not offer any explanation as to the cause of my condition. After I graduated college, I moved to Asheville and enrolled in Massage school, and soon after, got a job at the Chinese Acupuncture and Herbology Clinic (CAC) as an assistant. This was my first introduction into the world of Chinese Medicine. It was an honor to assist and learn about the gifts it had to offer. It compliments Western medicine so well. What attracted you to Daoist Traditions? As an assistant at CAC, I volunteered to film at a Jeffrey Yuen talk, when he first started coming to Asheville. I resonated so deeply with his Daoist and classical Chinese Medicine perspectives, I knew I wanted Daoist Traditions as my foundation, and Jeffrey Yuen as my teacher. Which class is your favorite to teach? Each class has its gifts, such as all things in life. My strengths lay in subtle energetics, and learning to feel the Qi – this shines in Adjunct Techniques. I also love to talk about the patterns that inform all of life, and Microsystems gives a good platform for this. I delight in empowering the students to bring this system of information to life, allowing this living medicine to move through them. Was there any one instructor at DT that really made an impression? Ann Wolman really helped the patterns, points, and herbs come together. Lori Fendell helped me understand and connect to the aspect of Chinese Medicine that cannot be taught, only awakened within, and she was a great support to me as I did so inside myself. Yefim Gamgoneishvili had such a specific understanding of orthopedics, which is an aspect of this medicine that I continue to study and use a lot in my practice. What do you like most about treating patients? I love to share my understanding of the patterns of life, so that others may too glean a more graceful way. I love helping people make their dreams come true, whether it’s an athlete competing in a competition, or helping a family come into manifestation. I long to have people be happy and shine their brightest! What is one piece of advice you would give to your students now? Pace yourself, this is a life long journey!